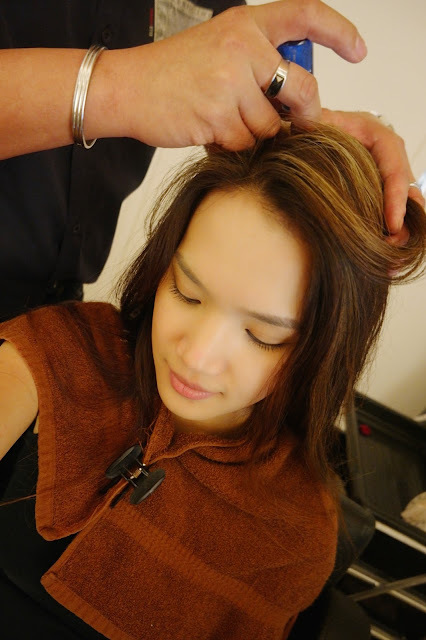 Paid a visit to Divo Hair Connection, Kota Damansara for a hair fix. It wasn't hard to spot as it was just beside Starbucks. You can easily park at the parking building located right behind the salon. Easily access is the top priority for all my beauty needs, I can't imagine circling round for parking during my beauty days. Lovely place with a comfy decor. I was then ushered to the VIP room for a scalp scan before proceeding to the treatments. The VIP room was uber comfortable and private. I was served a hot pot of flower tea before my session begun. My stylist did a brief explanation using charts to show me problematic scalp just to give me a rough idea of what I should be spotting for and etc. Picture above is how a healthy scalp should look like, with clear, almost translucent surface, healthy strands of hair and at least more than two strands popping out from each pore. I had scalp inflammation and dandruff. All thanks to my late nights and of course, stress. At that point I felt hopeless and like I should've done more than to think it'll all go away with over the counter shampoos. I was too swamped with work that at times I would just do a quick rinse! I was mortified and sad but thankfully they were gonna fix this today! Without further ado, a scalp treatment was applied. My scalp felt less itchy (it wasn't that itchy to begin with as it wasn't so bad as it looked) and it was such a joy. After a quick rinse, another serum was applied on my scalp to help soothe and protect my scalp also helps with reducing the redness. Then left on for about 10 minutes under this cool alien-like machine that transmit blue light. Before you think it's all fun and games the blue light helps the process of absorbing the serum into the scalp and hair follicles. After another rinse, it was the last step which is a hair tonic to help replenish nutrients and protect my scalp. To assist the absorbing process, this claw-like light machine was used. Finally after a thorough wash and blow dry I was shown my now cleaned and fresh scalp! What would've taken me a painstakingly long time to remove and heal was done in an hour? My scalp felt fresh right away and even my hair felt bouncier, filled with volume. Then I was given a hair makeover. Since my previous color was an ombre dip dye, I was given highlights to amp up the dimension and a lighter ton over cause I insisted on a new look. Loving how it is more dimensional, volumized and of course healthier! I didn't even get a cut to achieve this look. You can look for my the director, Bryan and I'm sure he'll recommend the best treatments and color for you.